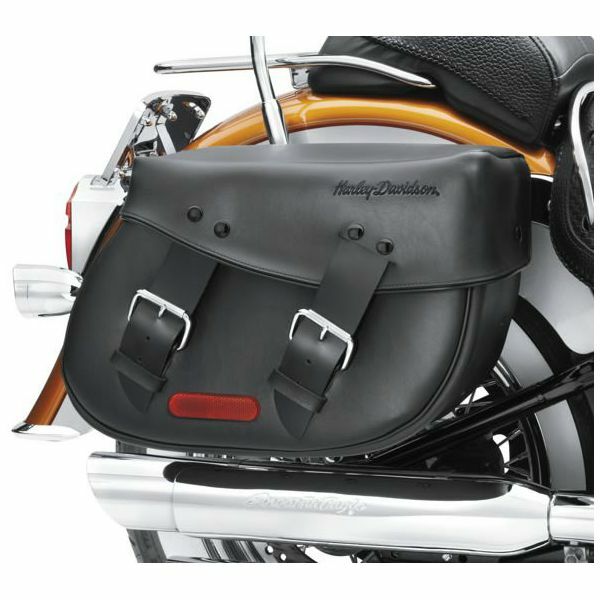 These handsome bags are the perfect accessory for your Softail® model. The large interior leaves plenty of room for all of your essentials and an inner pocket allows for quick access to small items such as keys, sunglasses, and wallets. 91537-00C fits '00-later Softail® models (except FLS, FLSTNSE, FXCW, FXCWC, FXS, FXSB, FXSBSE, and FXSTD). Also fits '09 FXSTSSE3 models. FXSTC models require separate purchase of Hardware Kit P/N 90573-07. Also fits '84-'99 FLSTF, FXST, FXSTC and FXSTS models without Detachables when installed with Directional Relocation Kit P/N 53692-96. Does not fit with Rear Axle Covers, Wide Tire Kit P/N 43684-99A or Flat Lens Turn Signal Kit P/N 68431-95.